An integral part of Frontier Wars clashes, and many other similar soldier-settler periods is including armed civilians. The period I’m looking at is around the napoleonic era so suitably clothed civilians of that time, or perhaps a little earlier, are what we need. There are not really to many candidates for these figures despite the popularity of the era. 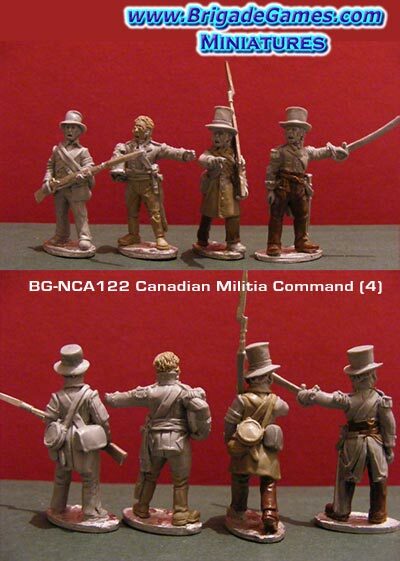 The two places I’ve found suitably clothed and equipped settlers are from the Empress Miniatures 1840s New Zealand Wars line, the militia figures and Brigade Games War of 1812 (U.S. and Canadian) militia figures. That tall top hat very much captures the style of the era. Whilst not every button and detail are correct they are close enough and look good on table and naturally enough do double duty for the two ranges they come from ie NZ wars and War of 1812…both periods of interest to me. Further use would be for the Texan war of Independence, Black Hawk War of 1832, Napoleonics and a number of other similar time period conflicts. These ranges provide enough variation in nice skirmish gaming ‘action’ poses to fit the bill – they also look to be from the hand of the same sculptor, one of my favourite, Paul Hicks. 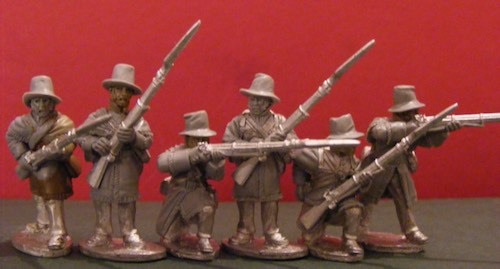 The above miniatures provide plenty of variation and an interesting mix of civilian and military accoutrements to look like soldier-settlers in early 19th century Australia…at least to my mind. Colors I used on these first six miniatures are simple plain pastel colors reflective of a number of images of the time and the color palette of the day. The usual paint technique of blocking in colors and judiciously using all three Army Painter dips to provide the right tone and shade onto the miniatures is used with the odd touch up here and there to make some detail ‘pop’ just in case the dip knocks the color down too much – flat spray afterwards and job done.